With the Super Bowl coming up, I thought it would be fun to share one of our all-time family favorite dip recipes! 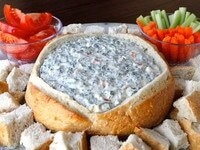 A Super Bowl celebration wouldn’t be complete without yummy finger foods, noshes, and dips. This creamy, rich dip tops them all! 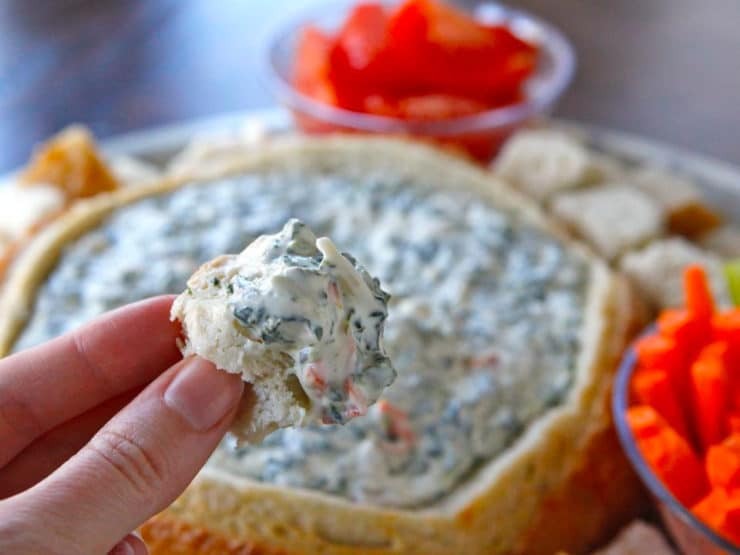 In our family, we call this Aunt Carol’s Spinach Dip. It’s a recipe many of you are probably familiar with, you can find on the back of most Lipton and Knorr Vegetable recipe mix boxes/packets. My Aunt Carol has brought it to our holiday gatherings for as long as I can remember. I’ve made the dip on my own many times, but for some reason Aunt Carol’s always tastes the best. I called her to ask if she has any special tips for making the dip. Tip #2: Mix the mayonnaise, sour cream, and soup mix together first. Carol recommends refrigerating this mixture overnight to let the flavors blend. Tip #3: If you’re using frozen spinach, after defrosting make sure you “squeeze the heck” out of the spinach to make sure all the excess liquid is removed. Tip #4: Stir in the spinach, chopped water chestnuts, and optional green onions just before serving. Tip #5: Serve the dip well chilled. These tips are great, but I think the real reason Aunt Carol’s dip tastes best is that she makes it with love. She’s one of the most amazing people I know, a terrific mother who is dedicated to her family. I’ve heard her described as an “angel on earth.” Whenever I serve this dip, I think of her and my heart warms. She is a really special lady. One taste of this dip, and I know you’ll agree! I like serving Aunt Carol’s Spinach Dip with San Luis Sourdough, a sourdough bread that originated in San Luis Obispo county where I grew up. San Luis Sourdough is the ultimate… the culturing process they use creates a super-sour bread with a fantastic texture. I use a large sourdough round, then I hollow out a hole in the middle of the bread to create a bowl where you can pour the dip. Cut the bread that you hollowed out into chunks, and it’s absolutely perfect for dipping, especially at a Sunday Super Bowl bash. You can also cut veggie sticks for dipping– carrots, celery, and bell peppers all work well. Kosher Note: Knorr’s Vegetable recipe mix is vegetable based, but I have not been able to find it with a kosher hechsher. However, Lipton “Kosher Recipe Secrets” Vegetable Recipe Soup and Dip Mix is kosher, and it will work just as well– so if you’re strictly kosher and looking for a hechsher, use the Lipton mix! We’re really looking forward to Super Bowl Sunday. I’m a 49ers girl, but now that they’re out of the running, I’m not really sure who to cheer for. New England Patriots? New York Giants? What do you think? 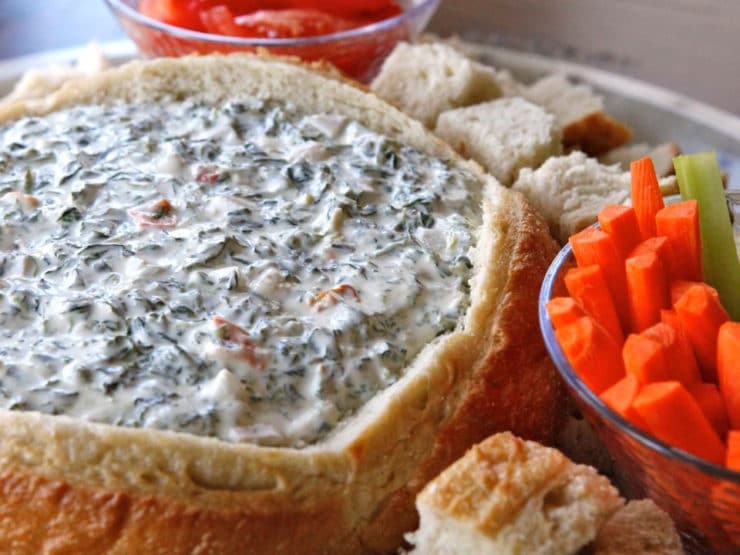 Recipe for Aunt Carol's Spinach Dip. Delicious, creamy appetizer with sourdough bread for dipping. Perfect for parties, potlucks. Kosher, Dairy. 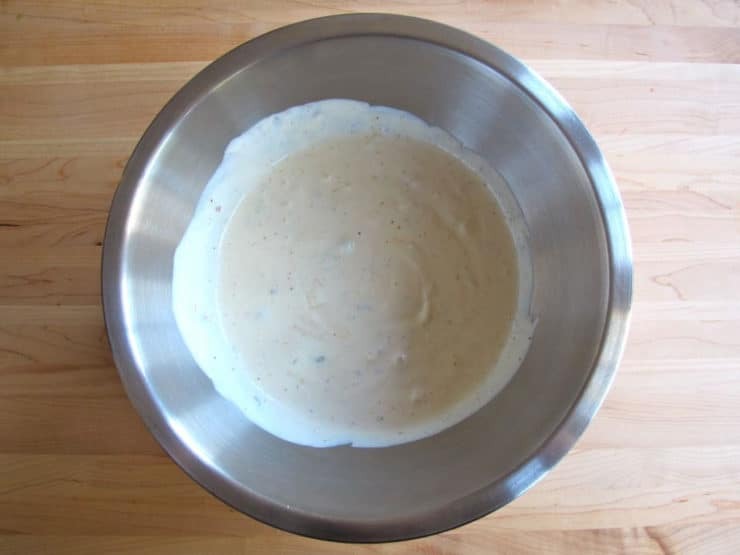 In a mixing bowl, combine vegetable recipe mix with sour cream and mayonnaise. Stir in the spinach, chopped water chestnuts, and onions (optional) a few minutes before serving. 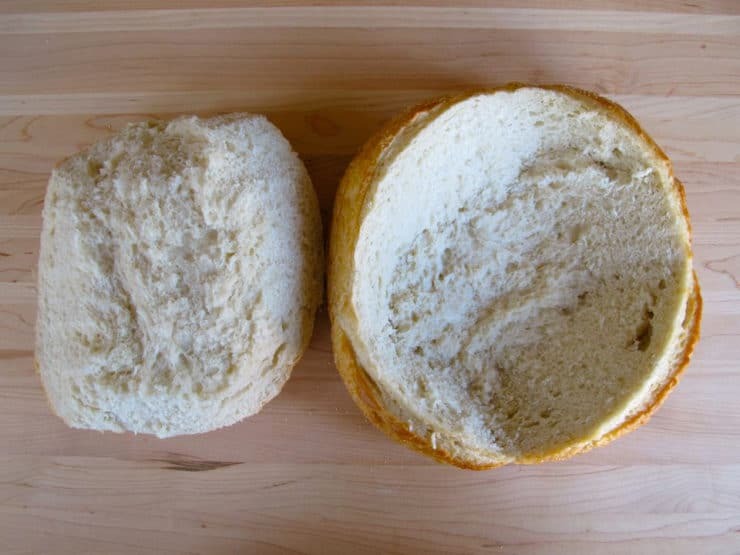 If you plan to serve this in a sourdough or other bread round loaf, carve a large round hole into the top of the loaf, letting your knife sink about 3/4 way into the loaf with every stroke. 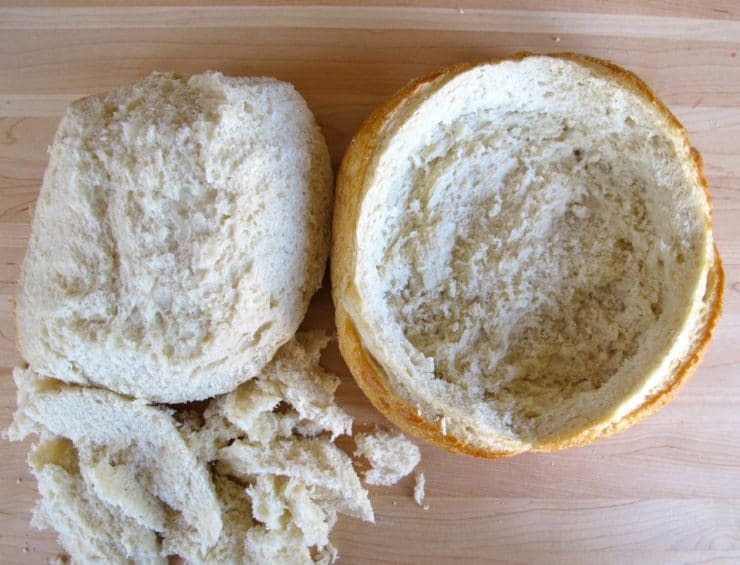 Pull to remove the round piece of bread to form a hollow, bowl-like center in the loaf. Use your knife to cut out any chunks of excess bread inside the loaf, leaving enough behind to form a solid bowl shape that will hold a wet dip. 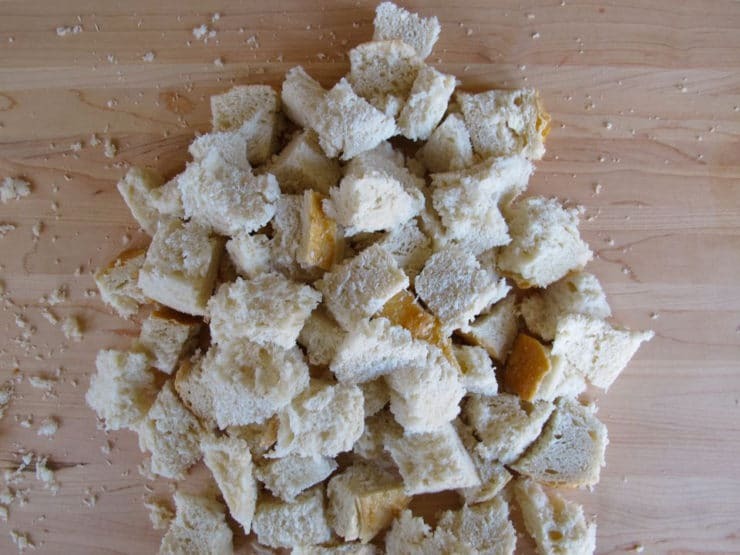 Cut the center round piece that you removed and the excess bread bits into bite-size chunks. 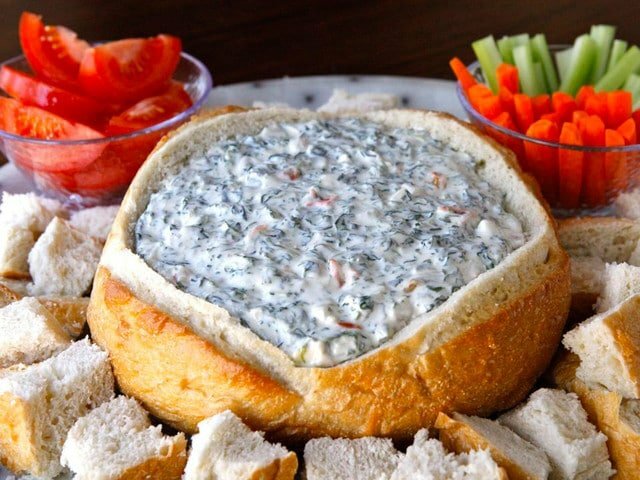 Pour dip into the center of the bread bowl surrounded by the bread chunks and any other dipping items you wish to serve (vegetable crudites, chips, crackers). Mixing in some artificial crab lends a nice addition and if you pick the right artificial crab, you can still keep it kosher. Try substituting bamboo shoots for the water chestnuts. Great hint. .use a potato ricer to squeeze out thawed spinach. My ricer has different disks, so, I use only with the smallest holes. i love this recipe but if you want to jazz it up a bit add a sizeable chunk of very sharp natural cheddar, shredded. stir as u shred to not clump. increase the amount of water chestnuts by 1/2, add the bottoms of three more scallions and use vegganaise brand mayo- u can find it in refrigerated section of sprouts or sun harvest or any of the whole food franchises. i was a helmans addict till i tried this stuff, truly memorable. be sure to include jicama as a dipping implement! I’m also a fan of Veganaise, it’s good stuff! the secret is Hellman’s mayonaise — huge difference ! I like to add cut-up red pepper to this dip. Adds a nice crunch and a little extra sweetness. Also, i’ve moved from frozen to fresh spinach. Not having to squeeze out the leaves makes the preparation faster and so much nicer. Surprisingly the texture of the spinach ends up the same. Perhaps the fresh spinach wilts in the dip. Thanks for your wonderful website and effervescent spirit. Thank you for your kind comment Eleasha! I will try this with fresh spinach next time. Dying to make this dip! I love San Luis sliced Sourdough, but have never seen the “round” loaf in any of the supermarkets here in Los Angeles. Wondering where you buy your rounds from? Hi Kacey, it’s sad but true! They used to sell round loaves at Trader Joe’s but I haven’t seen them for some time now. I really prefer the San Luis Sourdough, so I’ve resorted to buying the sliced loaf and cutting up the slices, then putting the dip into a bowl. Sad to compromise… wish they’d bring back the whole loaves! I haven’t made this in a long, long time; add a shot of plain vodka, after it is mixed up and put into the fridge. Adds a little oomph to mix. I like to make this dip but substitute roasted pecans for the water chestnuts. Roasting the pecans is a must. My kids don’t like water chestnuts, so I substitute toasted almonds. Our church is giving a Seder Presentation, but not serving the Seder meal. we are having appetizers during a break in the presentation, would this be suitable to serve? Aunt Carol is onto something; and I so want a big slice of that sourdough bread! These are some great tips! I’m happy finding this post because mine never tastes quite as good as the ideal spinach dip that I hold up in my mind. I’m not opposed to using full fat, and I think de-soggifying the spinach as much as possible is a great idea. This looks just fabulous. Thanks for sharing! I’m printing it off and adding it to my shopping list now. 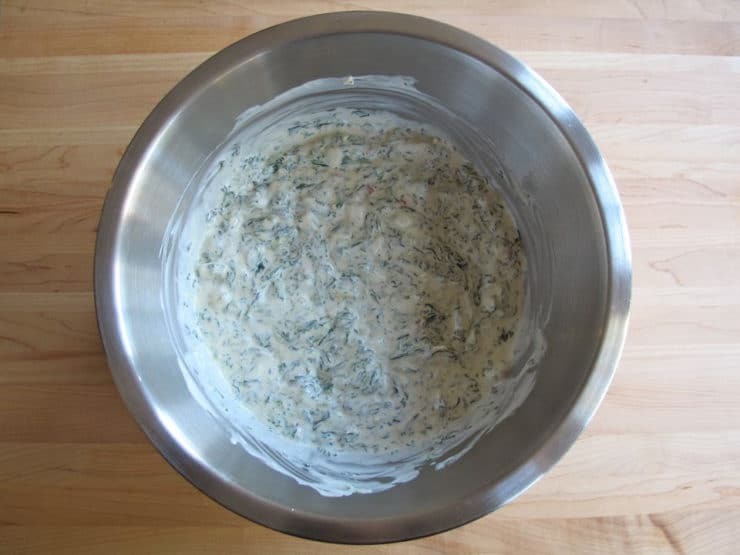 I have a recipe for a hot spinach artichoke dip that always gets rave reviews, if you’re interested. I love the sourdough container. This looks great. I had this dip when I was in the US and loved it. Not known over here…need to recreate this. Yum. My hubs would go crazy for this one. I am not a dip fan but the guys love it. I need to try this one out. Love the idea of putting it in the bread bowl. So pretty. Oh, yes, I have had this dip and it is one of my favorites too! I love the crunch from the water chestnuts!! When it comes to my dips – full-fat is the way to go. This is scrumptious and I might even share. As far as who you should be rooting for, as a disappointed Colts fan I’m pulling for the Giants. There’s something about New England that just bugs me…I’m obviosly very analytical about choosing my teams – ha! Let me know how you like it! It’s so creamy and yummy. Nice! I have never tried the pumpernickel with this, but I bet the flavors go together perfectly! Oh Tori that looks delish! The presentation is beautiful, love it! Will have to try this soon! Do you think I could sub something for the water chestnuts though? Jicama for crunch? Love the way you present all of your delicious recipes! This dip is one I knew,but thanks for the reminder! It’s the perfect thing to take to a Sisterhood dinner next week! I think I will try Greek Yogurt in place of the sour cream.The ladies will appreciate that.Thanks,Tori! You’re welcome Sheila! I’ve often wondered what it would taste like with the Greek yogurt substitution. Please let us know how you like it!